There is a dark secret in my heart. Well, maybe my closet. Its about clothing. It all started out so innocently. There were kids. They grew, and their clothes did not. So, I got a nice bin and put the too small clothes in there and up in an attic closet. Then there were more kids. They too grew, and their clothes did not. So I got more bins, and they were filled and put in the closet. For a good run, several years maybe, I was able to get more bins and put stuff neatly in the closet. But then, the little kids began to fit in the big kid's clothes. And so there was two-way traffic in the closet. And all those bins started to mix into each other. Then the kids started to be in the same clothes from year to year, so seasonal re-usable clothing became a bin, too. And one day, I couldn't quite close the closet door. I sort of pushed things around until the door would fully close. Then I got more bins and put them in each child's room. I put too small clothes in those bins, right in their closet. And when the time came to hand them down, they were easy to find. The system worked perfectly. But then, there was that attic closet. I mostly forgot about it, except for at around 3 am some nights, right before thoughts of my mortality and after wondering whether the bunny had been fed. That's all over now. I cleaned that closet out (mainly because my dark secret was discovered when we decided to finish our basement, which meant that the attic closet was needed to store basement stuff.) So now, I keep everything in the kids' closets. And it's a mess. Total and utter. Or it was until I got my closets together. In all of this organizing, I learned a few lessons. Not everything has to be handed down. I used to just put all of the too small stuff away for the next kid. But then I would sort through that stuff and find things with stains, rips and worse, things that were just stupid (I'm looking at you Giraffe with Sunglasses tank, size 8). So it's cool to put things in the giveaway or sell pile rather than hand it down. Pick maybe one third of the oldest kids' stuff to hand down. Maybe two thirds if you have twins who are younger. But that's it! Be thoughtful about what you gift to family. I used to put everything that was too small for my youngest into two bags, one for my sister and one for my sister-in-law. Over time, I realized that I was not seeing those clothes on my nieces and nephews. I think it was basically that a giant garbage bag of jumbled up clothes was hard to sort through for the good stuff. I think they appreciate a few things that can be family traditions -- for myself I remember a pair of jeans with patches that all of the cousins wore -- rather than a giant explosion of clothes. Where can you donate something specific right now? There are also some time and item specific drives like the denim drive for the Market Street Mission. The YMCA also does an annual winter coat drive in December. What else can you do with clothes you don't need? How about a consignment store? There are three that have great programs for nicer clothes New Leaf (Maternity and children's clothes) Sprouts (women's clothing) And for designer clothes 2nd time around. But for me, Kid's Consignments on Lincoln Place is the bomb. You just drop any clothes or even toys, books, CDs -- whatever you have and they sell it. They will donate items they can't sell, which is fine by me. But it is a thrill to just unload this stuff without any judgement and maybe walk away later with a modest check. 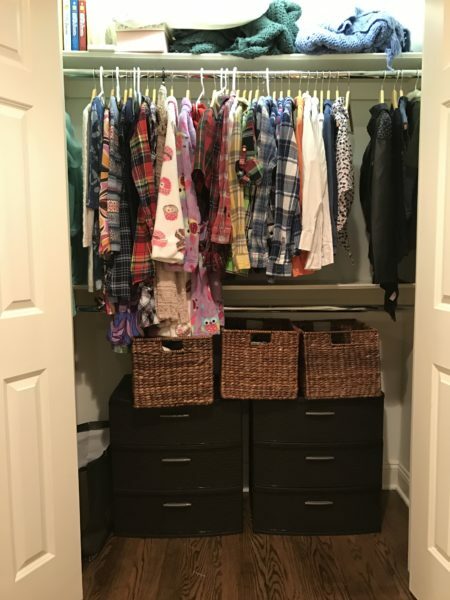 Closet of my dreams: I always thought the best way to keep off season and in between kids clothes in order would be with a series of dressers. And now I have some! I found inexpensive sterility dressers like these[amazon_link id="B00V87C10Q" target="_blank" ]Sterilite 01986P01 3 Weave Drawer Unit, Espresso with Driftwood Handles and Legs, 1-Pack[/amazon_link]. I can fit two in the bottom of my daughter's closet and then there's room for one to be off season clothes and the other clothes she isn't quite big enough for from her sister. I have a few bins for things like bathing suits, ski clothing and seasonal clothes that don't fit the school dress code. I still have hanging space on the top. It makes me happy just to look at it!